Peplum designs are so hot right now and this number is no exception, it’s trendy, stylish and unique with a dazzling array of sequin sparkle in a luscious shade of gold. Ideal for nights on the town this piece is also extremely practical too, as it has longer length sleeves to keep you nice and warm on chilly nights out on the town this season! Everyone knows that peplum cuts flatter the female form beautifully, they accentuate curves for the ideal hourglass look as well as conceal tummies – perfect! 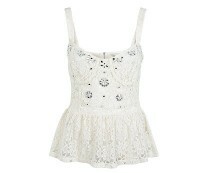 A top like this will not need much styling to make it look fabulous because just as it is, it’s stunning. Worn with jeans you can dress up your look or for full on glamour opt for a fitted black pencil skirt and killer heels. We love how the concealed back zip allows you to easily pop it on and off you go!